Nothing reinforces the relationship between mechanical work and heat better than hand cranking a generator to produce electricity and electrically heating water. 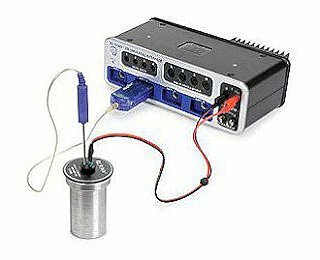 With the Energy Transfer – Calorimeter and the interface to measure temperature and voltage, the student role turns a qualitative demonstration into a quantitative experiment. The amount of electrical energy used to heat the water is equal to the area under the power versus time curve. The amount of heat delivered to the water can be calculated using the increase in temperature and the mass of the water. The comparison of the electrical energy to the heat results in a value for the number of Joules in a calorie. The top graph displays the power output from the generator and the bottom graph the increase in temperature. The amount of electrical energy used to heat to the water is determined by finding the area under the power versus time curve.